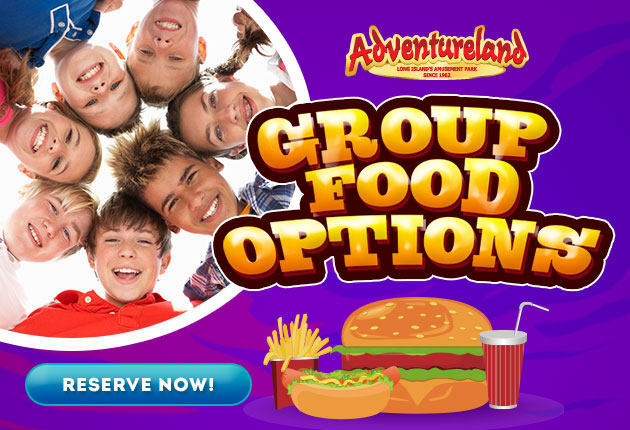 Visiting Adventureland with your Group is now easier and tastier than ever with our Group Food Package available to any of our group guests. The food package is $8 per person and includes a choice of hotdog, hamburger, or chicken nuggets and a side of french fries and a small soft drink. Our food package offers groups a $2 savings per person. If you or someone in your group is a vegetarian or has a health restriction but would still like to participate in the food package, please E-mail us us or call us at 631-494-2557 and Adventureland would be more than happy to assist you with accommodations.